“You know, you write like a guy.” Those might be fighting words for another woman, but Tammy Nuzzo-Morgan took them as a high compliment, coming as they did from a fellow poet, in admiration of her down-to-earth style. She describes her own work as confessional, or “housewife style,” explaining that Robert Lowell used the term to describe the work of Anne Sexton, the Pulitzer Prize-winning poet who pioneered modern confessional poetry. 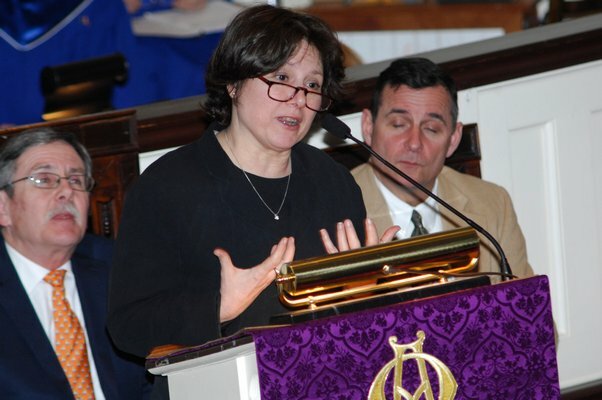 The Walt Whitman Birthplace Association in Huntington recently named Ms. Nuzzo-Morgan Long Island Poet of the Year. A resident of North Sea since 1990, the Patchogue native was also Suffolk County Poet Laureate for 2010 to 2011 and has authored several books of poetry, including “Let Me Tell You Something,” which earned a Pulitzer Prize nomination in 2006. While many might imagine a poet’s life to be spent in isolation, spinning words like silk in an ivory tower somewhere, Ms. Nuzzo-Morgan is very much a poet activist. It was Mr. Edmonds who nominated her for the Poet of the Year award, both for her artistic talent and commitment to the community. As founder of the nonprofit North Sea Poetry Scene, which she started “to enrich lives through poetry and literary programs,” Ms. Nuzzo-Morgan has brought poetry to schools, community groups and prisons. Noting that Whitman was renowned for endlessly revising his work, she said she will often revise a piece repeatedly until it works as a snapshot of a place, a feeling, a memory. “If I write a poem about longing, and read it to a group in a nursing home, and they can relate to that, and I see a reaction in them, I know I’ve done my job. An award ceremony for, and a reading by, Tammy Nuzzo-Morgan will be held on Sunday, April 23, from 2 to 4 p.m. at the Walt Whitman Birthplace Association, 246 Old Walt Whitman Road, Huntington. The program is free and open to the public.